Seems like when Mum tore this out of the Woman’s Day she missed the last few lines so has handwritten them on the bottom. Her instructions read “other half 27cm” and “over with pastry. 200o C, 400oF – 40 mins”. I’ll add my comments – that this could be a hearty pie for vegetarians by simply substituting the bacon for extra vegetables. 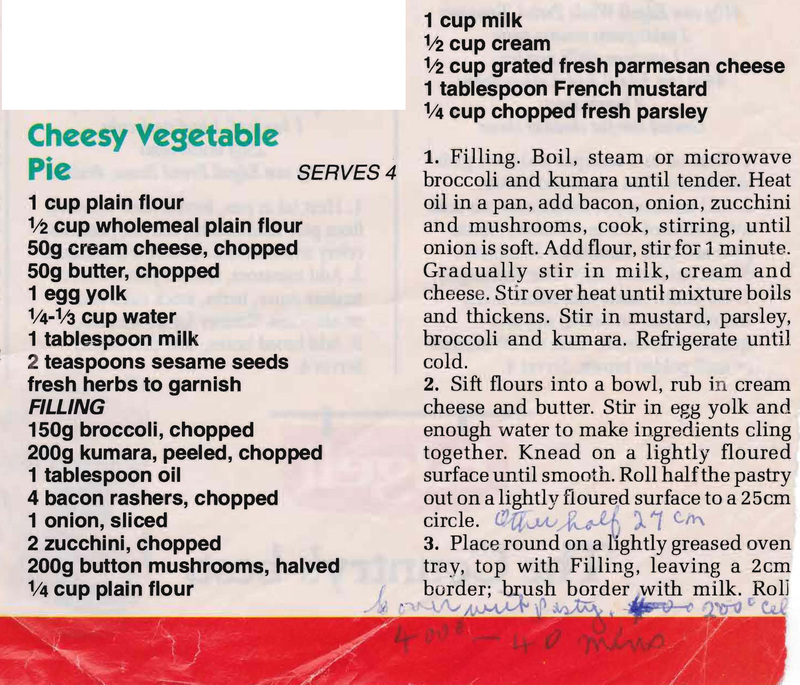 This entry was posted in All Recipes, Salads & Vegetables, Savoury Quiches/Pies/Patties and tagged 2000s, bacon, broccoli, cheesy vegetable pie, kumara, mushrooms, zucchini by bebsrecipes. Bookmark the permalink.